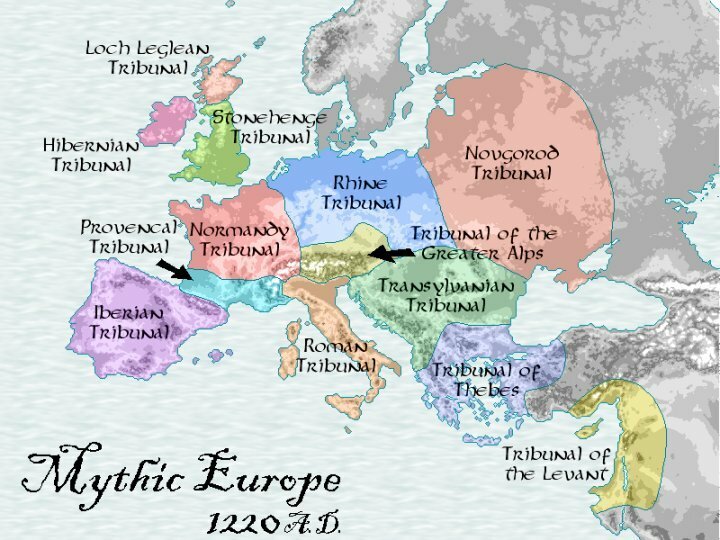 The Order of Hermes has divided Mythic Europe into 13 separate organisation regions, called Tribunals. Each region roughly corresponds to a nation or cultural area, and often reflects a distinct flavour and attitude. The term Tribunal also refers to the official gathering of members of a particular regional tribunal, which should occur once every seven years. These meetings are where the official political and organisation changes are ratified into law and confirmed. Once ever 33 years a Grand Tribunal meeting is held, which controls laws and decisions across the Order. (Much of the material below is sourced from Atlas forum topic, ArsMagicaWiki, and the Ars Magica 4th Ed pdf, via Cuchulainshound, and then modified for flavour and to suit our troupe’s sagas). The Hibernian Tribunal, which consists of Hibernia and some nearby islands, is a small tribunal at the edge of Christendom. The land is wild and magical, and most magi live in isolation from the population of the land. Nevertheless, because of the relatively small size of the tribunal, a great percentage of the magi in the tribunal are involved in tribunal politics. The Loch Leglean Tribunal covers Scotland and the northern islands, including the Shetland and Orkney Islands. This area is highly mystical, and has the distinction that the local populace is generally more accepting of magi than folk are elsewhere. The majority of magi here are of House Ex Miscellanea, being members of the Gruagach tradition. Arch-Muein – a once powerful summer covenant located in the Shetland Islands, with a sole surviving member, the Arch Magus Pentaris who is known as an intimidating and wrathful Tremere magus. Crun Clach – open and politically neutral covenant located in the middle of Scotland. Second most powerful covenant from Horsingas, although far more demure in presence in mundane issues. The Praeco of the tribunal named Caitlin Suil Uaine (a Merinita) lives at this covenant. Horsingas – a highly populated and politically and militarily powerful covenant, which leads the tribunal’s activities. Typically the location for the Tribunal gatherings. Loch Lomond – a small covenant of primarily Bjornaer magi spread across a few of the islands within Loch Lomond. The covenant is known for excellent relationship with locals, and a quiet humility in Tribunal matters. Mac Gruagach – the gathering home for the Gruagach tradition magi in Loch Leglean. The covenant’s charter holds membership far above that which is typically found at the covenant. Mac Gruagach seems to prefers to remain isolated from the politics and activities of the Tribunal and the Order. The Grugach are heavily populated around Creag Riabhach in the north west of the Scottish mainland. Covenant of the Six Pillars – a small covenant in the midlands, founded recently (1197 AD), which passed directly from Spring to Winter due to ongoing conflicts with Horsingas and several members of senior Stone henge tribunal covenants, resulting in more than four Wizard’s Wars. The surviving three magi are typically absent from tribunal proceedings. The covenant is named for its close proximity to Six Pillar Hill, a mystical site now controlled by Horsingas. Storm Watch – beyond the mainland amongst a small network of islands, battered by the ocean and in almost total disrepair the Covenant of Storm Watch is build on the grounds of a far more ancient covenant. It is newly formed (spring 1220) and has seven members from a variety of houses. Whitenoch – located on Loch Mullardoch, the covenant is highly fortified and difficult to reach, with no roads within easy access. A noted feature of the covenant is an ancient white tree, which grants clarity and visions. The covenant is exclusively focused on members from House Ex Miscellanea, with seven members. The Stonehenge Tribunal covers England and Wales. The domus magna of House Ex Miscellanea, Cad Gadu, is located in this tribunal. The Stonehenge Tribunal is disorganized, in part because many of the tribunal’s magi live in isolation, and in part because of the rapid clearing of land and forest deprive them of the opportunity of live apart from society in magical areas. The Iberian Tribunal covers all of the Iberian peninsula, including land currently held by the Moors. The politics of the Iberian Tribunal are chiefly concerned with the Reconquista, though there is certainly nothing that could be called agreement among the magi. At least two covenants routinely side with the Moors against the Christian forces. Although conflict is common, many covenants have a great wealth of both mundane and occult knowledge, plundered from conquered Moslem libraries and gained from Moorish scholars. You can find more information in the Ars Magica supplement Iberia. 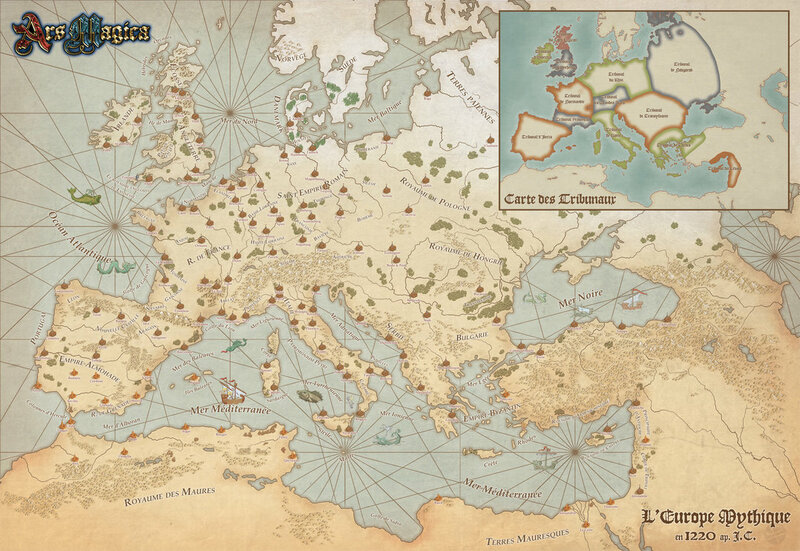 The Normandy Tribunal covers France, including Burgundy and the Low Countries. It is home to Fudarus, the domus magna of House Tytalus. As the land here becomes more and more crowded with mundanes and the influence of the Dominion, the covenants of the tribunal must become more and more hidden and isolated. Remaining apart from the mundanes becomes a more difficult task with each passing year. The Provençal Tribunal covers Languedoc, including Gascony and the Pyrenees. It contains Val-Negra, the domus magna of House Flambeau. The Provençal Tribunal is the cultural center of the Order, and perhaps its political center as well. Magi of Jerbiton are quite active here, and so relations with the mundanes are quite good. Many old and powerful covenants are found within this covenant. The Rhine Tribunal consists of the lands of the Holy Roman Empire north of the Alps—Germany and the Rhine valley. Within its boundaries lie Durenmar, domus magna of House Bonisagus; Crintera, domus magna of House Bjornaer; and Irencillia, domus magna of House Merinita. Once the center of the Order, the Rhine Tribunal’s power has decreased as the area has become more and more densely populated with time’s passage. Some magi have started to involve themselves in the politics of the Empire, much to the displeasure of the quaesitores. The Tribunal of the Greater Alps holds sway in the region around the Alps, including Bavaria. It is home to Valnastium, domus magna of House Jerbiton, and the Cave of Twisting Shadows, domus magna of House Criamon. The old covenants of this tribunal strictly enforce the status quo, allowing no new covenants to be formed within its borders. This lends the tribunal peace and stability, which its members enjoy. The Roman Tribunal covers the southernmost portion of the Holy Roman Empire—the Papal states, the Kingdom of Naples, Sicily, Sardinia, Corsica, and even has one covenant in North Africa. Harco, domus magna of House Mercere; Magvillus, domus magna of House Guernicus; and Verdi, domus magna of House Verditius are found here. This is the tribunal where magi are most involved in the world— living in cities, having political relationships with aristocrats, and selling their magical wares to mundanes. Most of the members of the Order here are quite cosmopolitan, and spend a great deal of time in the great cities. Some do not belong to covenants, or do so only in name. Relations among the covenants and magi are a nightmare mass of Byzantine political machinations. More information can be found in the Ars Magica supplement Rome. The Tribunal of Thebes consists of the Byzantine Empire—Greece, Asia Minor, and the islands of the Aegean Sea. This tribunal includes the great city of Constantinople; one covenant is even found within its walls. The lands of Greece, though they fell from glory long ago, still have a great deal of magic to offer to those who live here. The Transylvanian Tribunal consists of the kingdoms of Bulgaria and Hungary. The domus magna of House Tremere, Coeris, is found here. This area is perhaps the most magically potent of the tribunals, for the power of the Dominion is still quite weak. Although this makes the Transylvanian Tribunal one of the fastest growing in the Order, it also means that outside magical threats also abound. The Tremere have total political dominance in this tribunal. The Tribunal of the Levant governs the magi of Christian Palestine, as well as a few covenants scattered throughout Egypt, Asia Minor, and Syria. The covenants of this tribunal have managed to find great knowledge both in the remains of earlier civilizations and in the Muslim scholars and sorcerers who live in this area. The Novgorod Tribunal is the farthest eastern tribunal in Christendom. It consists of the Kingdom of Poland and the Russian Principalities, as well as the Nordic and Slavic lands of the North. Vast amounts of unsettled land and little competition among Hermetic magi for magical resources make this area attractive, but problems with pagan wizards and Mongols can be severe.